Following the defeat of a proposed Affordable Care Act overhaul, the U.S. President and Congress will likely turn to potential Tax Code and regulatory relief reforms. Both President Trump and the GOP-lead House have put forth preliminary proposals for tax reform, with many similarities as well as key differences. Common to both proposals is a tax rate reduction to 4 levels (0%, 12%, 25%, and 33%). Among the differences are capital gain tax rates, investment income treatment, retirement savings incentives, allowed deduction types, and estate taxation. Likely developments in executive compensation emanating from tax reform would include declining incentives to defer current compensation, more payments to executives in the form of company stock to assist the executive in eventually recognizing capital gains tax treatment, and a further elimination of executive benefits with a greater preference for cash compensation. The Dodd-Frank financial reform legislation, enacted in 2010, has 7 elements addressing executive compensation. Three of these elements have been finalized and implemented over the past 5 years and are not likely to be rescinded or modified: SOP, Say-On-Golden Parachute, and Committee and Advisory Independence. Four elements of Dodd-Frank remain to be finalized and implemented, including the controversial CEO Pay Ratio disclosure (scheduled to be implemented in the 2018 proxy season). 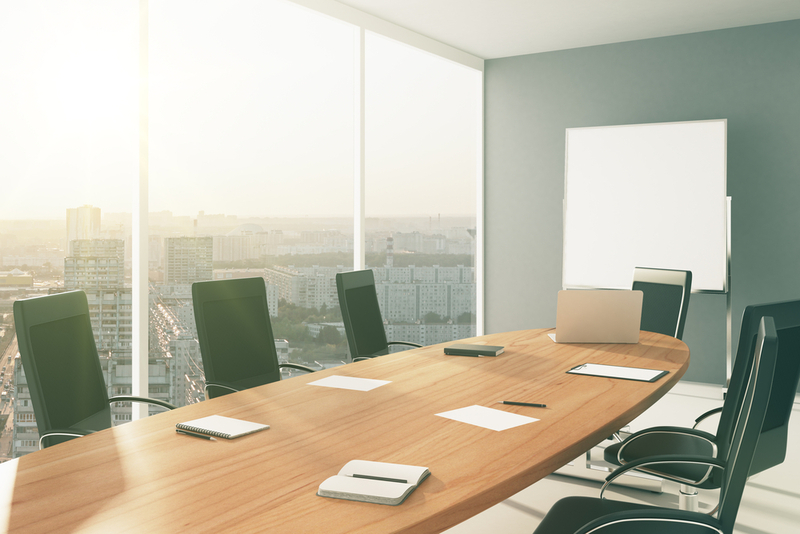 The CEO Pay Ratio disclosure may be difficult to repeal and/or revise without a substantive rewrite of financial reform legislation since final rules have been released and approved by the SEC. However, the other 3 executive compensation elements of Dodd-Frank may be removed or amended in the near future. In the aftermath of the failed Affordable Care Act (“Obamacare”) repeal and replace effort, the United States’ new administration announced its intent to shift focus to other high-priority issues. As noted in the latest press accounts, President Trump is anxious to tackle a comprehensive rewrite of the Tax Code. In concert with tax reform legislation, the President is also eager to relieve companies from the regulatory burden imposed by the Dodd-Frank financial reform legislation. 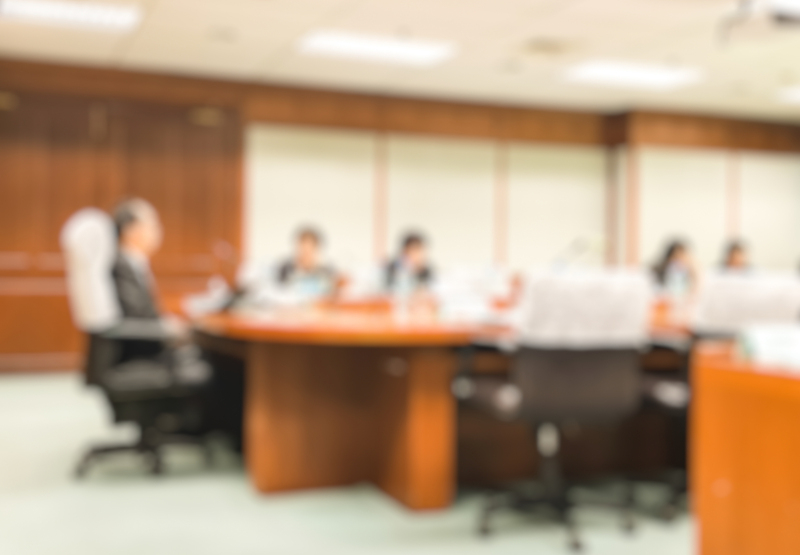 Because both matters will significantly impact executive compensation, we have provided an overview of both subjects — and possible executive compensation implications — in this Viewpoint. The details of any future tax reform will have to be negotiated during the law-making process; as we learned with respect to the health care reform efforts, it’s impossible to accurately estimate how certain provisions will eventually play out. Tax reform proposals set forth by the House GOP and President Trump include many key differences, but either would need bipartisan support for permanent tax legislation because Democrats maintain enough seats in the Senate to filibuster any new law. At this point, both proposals would reduce the number of income tax brackets for individuals to 4 (0%, 12%, 25%, and 33%) and repeal the 3.8% capital gains surtax that currently exists for the highest income bracket. However, the proposals contain several differences surrounding capital gains rates, investment income, retirement savings incentives, deductions, and estate taxes. Under the current GOP plan, bond interest income would receive a more favorable tax rate (effectively 50% of ordinary income rates). 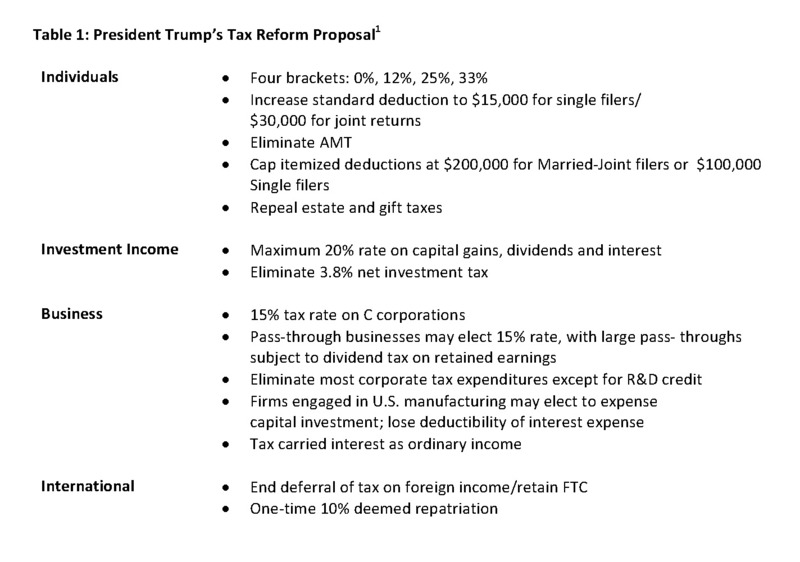 President Trump’s proposal does not eliminate any existing deductions but would set a cap of $100,000 for individuals and $200,000 for married taxpayers filing jointly, while the GOP plan keeps only the charitable and mortgage interest deductions and does not introduce a cap on the amount that taxpayers can deduct. Less Incentive to Defer Compensation — many companies provide non qualified deferred compensation plans so that executives can voluntarily defer compensation such as annual bonuses to a specified future date, including retirement. With a reduction in ordinary income tax rates, executives will be motivated to recognize the current income and forego future deferral opportunities. With lower tax rates, executives are likely to find their effective tax rate comparable to their current rate when earning income, offsetting many deferral advantages. Motivation to Pay Executives in Company Stock — the potential for reduced capital gains rates encourages companies to compensate executives in company shares. We expect many companies to continue emphasizing executive share ownership guidelines and the alignment of executive pay with total shareholder returns — this makes payment in company stock attractive because share payments will ultimately result in capital gains taxation when the executive elects to dispose of share payouts. We expect that reduced capital gains rates will impact LTI plan design and the potential payment of annual bonuses in some mix of cash and company shares. Further Declines in Executive Benefits and Perquisites — In recent years, many companies stopped compensating executives through executive benefits like company automobiles, club memberships, and supplemental medical plans. We expect this trend to continue, as there will be more compelling reasons to offer cash compensation in lieu of executive benefits and their potentially unfavorable disclosure to shareholders. Cash compensation will be king. 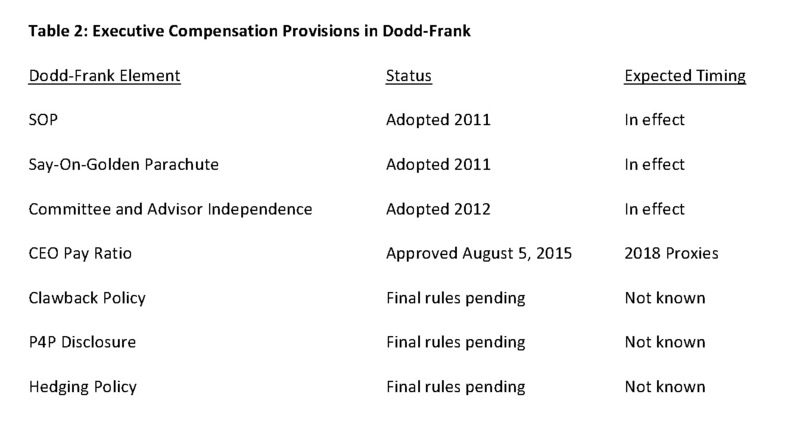 Three elements of Dodd-Frank have been fully implemented and have become integral to the executive compensation landscape for the past 5 years: SOP, Say-On-Golden Parachute, and Committee and Advisor Independence. We do not expect these 3 elements to be revised or removed, especially the SOP advisory vote: institutional investors and their advisors strongly support SOP and would become vocal against any attempt to remove the advisory vote requirement. Four elements of Dodd-Frank have yet to be fully implemented: CEO Pay Ratio, Clawback Policy, P4P Disclosure, and Hedging Policy. The CEO Pay Ratio rule — requiring companies to report the ratio of CEO pay to median employee pay — is the most controversial and administratively-burdensome of the 4 remaining rules. Final rules have been issued by the SEC for the CEO Pay Ratio disclosure, and companies are expected to report the ratio statistic with new proxies to be filed in 2018. However, the SEC recently announced a new 90-day comment period for companies struggling to comply with the new reporting requirement. Because the new final rules regarding the CEO Pay Ratio disclosure have been released and approved by the SEC, it may difficult for the SEC to repeal this regulation. The other 3 remaining regulations have yet to receive SEC approval of the final rules implementing the disclosure requirement. From a procedural standard, it will be easier for these 3 remaining regulations to be repealed by administrative means. 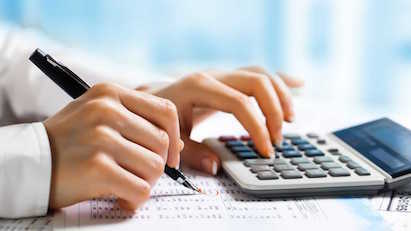 Our experience has been that most filing companies have already implemented some form of clawback and hedging policies. For most public companies, the required disclosure of executive compensation policies and practices, executive pay levels, and mandated compensation tables and charts result in 30 pages of proxy disclosure annually, on average. Some curtailment to new and additional disclosures would be a welcome relief for many organizations. As witnessed in the recent failed effort to legislate the new health care law, enacting major changes to the Tax Code and SEC disclosure requirements will not be easy. It has been close to 30 years since any major Tax Code overhaul, and the current political climate in Washington hinders sweeping change. If there are substantive changes to taxation and executive compensation disclosure in the near future, meaningful changes in corporate executive compensation programs are likely to follow. Although we can only speculate about the tax and disclosure changes to be put forth by Washington, it will be interesting to observe how companies react. 1. “What you need to know about tax reform.” PricewaterhouseCoopers. March 2017. http://www.pwc.com/us/en/washington-national-tax/us-tax-reform.html. 2. Will Rogers. In: Robert G. Moscatelli, ed. “The Quote Manual: Wisdom and Wit of the Ages.” 3rd ed. AuthorHouse. March 19, 2012.